Q&A: Waterproofing – Knowing your stuff! Specifying appropriate solutions to successfully waterproof an entire building is hard enough, but what if the specification is not even adhered to on site? WALLS & ROOFS asked a few professionals in the waterproofing industry for their insights. Harland Dix-Peek from Derbit and Elrene Smuts from a.b.e. Construction Chemicals weighed in. 1. How does one prevent waterproofing specification failures or specifications from being changed on site? The failure to transfer an agreed specification from paper to site application, as well as incorrect system specification, are two issues that have in recent years proven to be problematic, to say the least. Add to this a practice by some of specification alteration or product switch on site without the consent or knowledge of the professional team, and one can begin to understand the frustration within the industry. Driven by various factors, such as cost saving, simplicity of application or time saving, the original waterproofing specification is discarded without appreciating that the original specification was motivated by the product’s fit-for-purpose abilities in that specific application. This is a gamble that sometimes works, but in most instances, creates problems to the embarrassment of all concerned. In addition, misrepresentation of a system or product by a supplier, agent or manufacturer with regard to its abilities and performance creates further problems. An example is where waterproofing membranes manufactured specifically for buried applications are promoted as suitable for use in exposed areas – this would be inappropriate as the “buried” membrane is not designed to resist heat in an exposed application. The professional team is totally reliant on the integrity of the supplier, agent or manufacturer to present factual and technically supported information for them to specify systems and products that are fit for purpose. If a waterproofing system is misrepresented, this often results in system or product failure on site, even when specification by the professional team is properly carried out and the contractor strictly complies with the specification. A further pitfall is the notion that a written specification will be site-suitable without possible need for necessary amendment. For example, torch-fusing a bitumen waterproofing membrane to an excavated rock-face, which may now form the external shutter face for a concrete pour – this would be inappropriate and an alternative site specific solution would be required. The Internet has made the world a much smaller place. This means that anyone in the waterproofing industry who has some spare capital is able to source a product from around the world, some of these materials being of doubtful quality and bring in a container. The influx of cheap imported products with little to no local representation in terms of technical skills or services for warranties has led to the market being flooded by cheap products with no verifiable track record in this country. This means that longstanding companies who have built their reputations up over many years end up having their good names tarnished by the use of inferior products as the entire segment gets a bad name. A good distributor will provide appropriate specifications for the areas to be waterproofed. 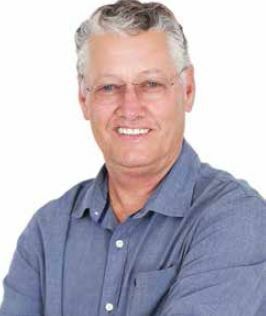 The way to prevent waterproofing specification failures on site is to ensure the involvement of a reputable distributor and applicator who has technical backup and services locally and making contact with the local supplier or distributor to ensure that the specifications being issued to site are in accordance with the manufacturer’s recommendations. Make use of the services that the local supplier is offering, but keep in mind that this technical service comes at a marginally higher price when compared to cheap imports with no backup. It is often advisable to consult with a distributor who can give presentations to facilitate an informed decision making process. It is also recommended that specifiers consult manufacturers and suppliers for product presentations in order to facilitate making informed decisions when it comes to distinguishing between quality products and cheaper alternatives. Very often, these cheaper alternatives have very little verifiable track record in the harsh South African climatic conditions which we experience here. 2. How can one ensure that the waterproofing product or system as specified is applied on site? It sometimes occurs that applicators apply alternative bitumen membranes on site rather than that specified, possibly under the incorrect assumption that all bitumen membranes are the same. This is not the case, and may be the leading contributor to waterproofing system failures on site. No two manufacturers of bitumen waterproofing membranes can assert to have the exact same raw material source, blend or modification, reinforcement(s) and location of the reinforcements in the membrane. For example, there is a significant difference between a single layer, single reinforced membrane and a single layer, dual reinforced membrane. In one system, for instance, the dual reinforced membranes are non-woven polyester reinforced for puncture resistance and have an additional fibre glass matt reinforcement on the surface to combat the extreme heat and ultraviolet (UV) of the African sun. Single reinforced membranes need extra surface protection in order to prevent premature ageing in the form of surface cracking and hardening or loss of plasticity. Because of this, some manufacturers of single reinforced membranes require a double layer of 3mm and 4mm as well as a bitumen aluminium coating if guarantees are to be provided. Some suppliers provide a competent team member to visit the site and assist in confirming that the product/system used is consistent with the specification. 3. So how do you tell one membrane from another, or know if the bitumen membrane is dual reinforced? If provided, one can look for the serial number embossed on the self-edge of the bitumen membrane, which is repeated every metre. This number will identify the manufacturer, the product, its specification, and the date and place of manufacture. This lot traceability is all relevant information to support the product or system guarantees. A dual reinforced bituminous membrane usually comprises a polyester carrier for impact resistance, and a clearly visible top layer of fibreglass membrane for heat and UV resistance. Look for the fibreglass layer. 4. Is there a way to double-check the installation afterwards? There are ways to check if the correct product that has been specified has been laid. To start with, it is only possible to inspect waterproofing systems that are readily accessible; any application where the waterproofing has been buried becomes almost impossible to inspect without incurring additional costs, for example tiled piazza areas and retaining walls. a. Firstly involve the reps of the specified suppliers. It is their job to ensure that they are there to assist professionals who specify their products. Go to site with them and spend time getting to know the products and learning what the reps look for when identifying their own products on site. b. Secondly, use the QA/inspection sheets that most reputable manufacturers or suppliers will have available to ensure that the specified systems are being laid in accordance with the manufacturer’s recommendations. If these question-and-answer (QA) forms have been followed at every step, there will be a paper trail detailing these inspection points, thereby ensuring that the correct products were used at each step of the installation process. c. Thirdly, if one is still unsure if the correct product has been used, call the manufacturer to confirm that the appointed sub-contractor did indeed purchase the required volumes of the specified product from a reputable supplier who can issue a copy of the invoice if required. 5. Is waterproofing taken seriously enough? Very often, waterproofing is not accorded the necessary attention that it deserves. It is considered a grudge spend when designing a building, as it is not a glamourous segment in terms of aesthetics for a building in the same way that structural sealants, glazing and flooring systems are. However, failure of the waterproofing system often means that the money spent on expensive fittings can be wasted when the building becomes flooded as a result of cost cutting on the waterproofing. In addition, the speed at which buildings are erected these days’ means that often the programme for the completion of the building is not adhered too. Waterproofing is completed long before it should be, with a high risk of the installed system being damaged by the numerous other trades that access the completed areas. Changes to the design of the building also often lead to the completed waterproofing system getting damaged by other contractors, and then it needs to be repaired (best-case scenario) or have to be re-laid (worst-case scenario) at huge cost to the client. As with any part or system of a building, waterproofing systems all require maintenance to be carried out on the roof in order to ensure that the systems are able to last the required time frames as put forward in the manufacturer’s conditions of warranty. Failure to adhere to the manufacturer’s or installer’s warranty requirements can result in premature failure of the system, thus voiding all the terms and conditions of the warranty. Regular maintenance programmes need to be instituted by facilities managers or home owners to ensure that waterproofing is suitably maintained, in order to prevent catastrophic failure of the system leading to flood damage that can be both cosmetic and structural in nature. Not all information can be acquired off the Internet. Personal interaction with reps is still preferable from both a relationship and trust building perspective, and this relationship is what ultimately leads to successful projects.  Ensure that products and systems, as promoted, are suitable for the task at hand and can be practically applied under the specific site conditions.  If the waterproofing product or system is supplied by an agent, supplier or distributor and not by the manufacturer itself, ask for the manufacturer’s original data sheets to confirm the information given through the third party.  Ensure that the applicator has an up-to-date certification for the intended application of the specified systems and products.  Be very specific rather than generic in the waterproofing specification to minimise confusion on site.  Get the supplier, agent, distributor or manufacturer involved in the specification so that they too can be held accountable.  Request a technical session with the agent, distributor, supplier or manufacturer to have them support the waterproofing system’s abilities in that particular application, and then ask them to give it in writing.  Request technical detail drawings pertinent to the project where the waterproofing is being specified.  Attend technical waterproofing presentations to better understand the workings of a given waterproofing product or system, and where it has been proven effective.  When asked to review an agreed specification for alternative supply, ask why and then why again. If price is the only motivator, it is very likely to cost more down the line.  Ensure that the contractor has applied the specified product or system.  Try to utilise waterproofing membranes that are serial-embossed for easy identification. 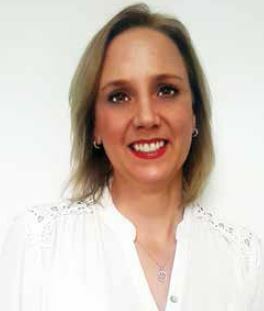 Full thanks and acknowledgment are given to Harland Dix-Peek of Derbit SA and Elrene Smuts of a.b.e Construction Chemicals for their participation in this Q&A. 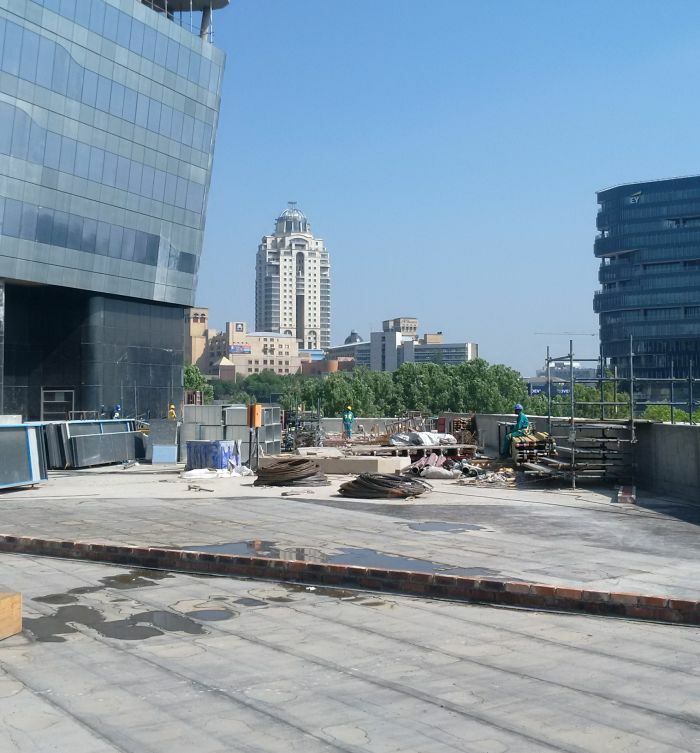 The piazza area at the new Sasol Head Office in Sandton was waterproofed to protect the concrete and its rebar content.